Please go to following url for the newest version. If you have a Cassandra cluster i am sure you have the problem of viewing the data instantly. Cassandra CLI is one of the tools but it would be easier if it has a nice UI and would more convenient for administrators. Cassandra Explore has been developed to make the things easier for Cassandra users. Extract the downloaded product and lets refer extracted folder as CARBON_HOME. You have two different options with Cassandra feature. 1. Use internal Cassandra Server . In this it will start internal Cassandra Server and you can use it to store data. 2. User External Cassandra Cluster. 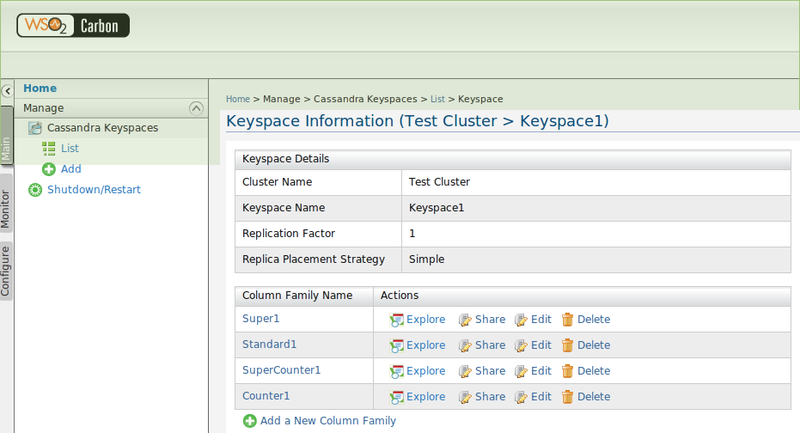 Click Cassandra Keyspaces ---> List to list down keyspaces. Select a keyspace from available keyspaces. Select a Column Family to Explore Data. Click on Explore icon to view data in a Column Family. View Data on Column Family. This will display rows and columns in the Column Family. In a Row you can paginate through Columns. If you need to retrieve a key quickly enter your row ID and click explore row. Click on a row link to view data. You can search a Name or Value through search Box and will update the results as you type. I'm very interested by your tool but I can't figure out to make it work. I'm trying to connect to a remote server. I've changed values in cassandra-component.xml and cassandra-endpoint.xml in repository/conf/etc but it seems that it always tries to connect to localhost. Is there something else to do ? An other file to edit ? Thanks for the feedback.Yes I found that there were some problems when connecting to a remote server.This was initially developed to browse the in built Cassandra Server (Did some rapid changes to make this available to all the Cassandra Users). This is being actively developed so we are planning to release a new version in coming weeks which will address all those remote connection issues.In that you can switch to any new Cassandra Server without restarting and all the configurations can be done through UI. so I'll wait for the next release ! You can try the new version here. The screenshot (in diagram 3/5) doesn't have "Explore" and "Share". Any idea? Java is a promient programming language in the current IT industry and the advanced level of Java courses are wanted by most of the professional. Your blog help me to observe some important points in Java language. The way you have explained the Big Data concept is really superb! I have never come across such a informative blog in my career. Nowadays, Hadoop course is in high demand by most of the professional to enhance their career.